When searching for the best sushi around Boston, three names kept popping up: O Ya, Oishii, and Oga’s (in Natick). After watching a wonderful documentary called, Jiro Dreams of Sushi, about the world’s greatest sushi chef, I became obsessed with trying truly high quality sushi. Unfortunately, such sushi is costly and far more expensive than most sushi places a person might visit casually. My friend, Double Down, went there with his girlfriend and highly recommended it. As a result, I waited for a special occasion to give Oishii a try, so when my birthday rolled around, my girlfriend and I gifted one another a dinner at Oishii since her birthday is only seven days after mine. I have to admit that I was skeptical at first. I understood that the sushi would be good. What I wasn’t ready for was how good and how much better the sushi actually was than anything I’d ever had before. I figured that some of the rave reviews just had to be hype trying to justify expensive pricing and ambience. I was wrong. 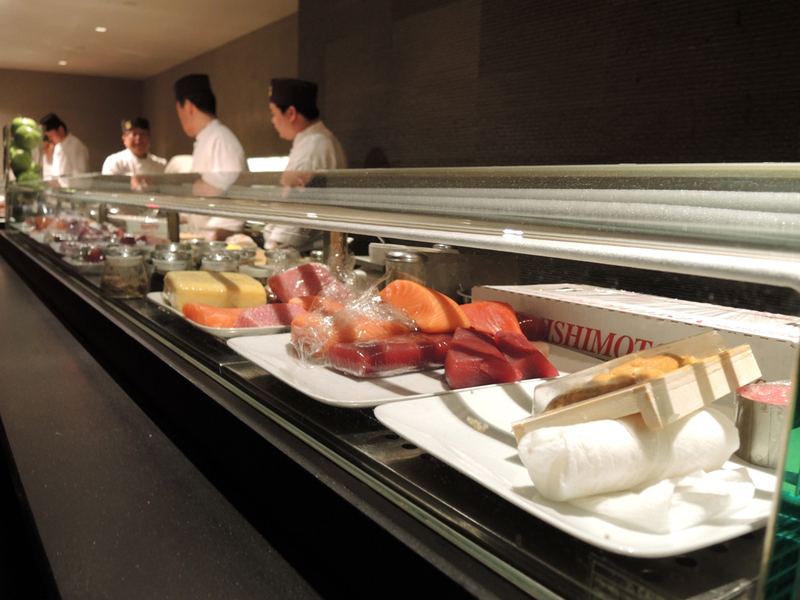 Whether or not Oishii is one of the best sushi restaurants in Boston, it is the best sushi I have ever had to date. Rather than waste any more time, let’s get on to the review. Upon arriving at Oishii, the only blemish of the night occurred at the entrance. While circling for parking on a Wednesday night, the Valet informed me that it cost $14 for Valet parking. Is that out of the norm for Boston or expensive restaurants? No, not really. Is it still outrageous? Yes. Especially, on a weekday when you can easily just park on the street (which is also what the Valet himself told me as he pointed to an empty spot a block away). While the cost for Valet Parking was just silly, the good recommendation and service I received from the Valet foreshadowed the good service we would receive inside the restaurant. When we entered through the front door, I was a little surprised by the modern “trendy” decor, lighting, and music playing. It had a cocktail lounge feel, but with all of the smells of a sushi restaurant. We were seated at a table across from the actual sushi bar where the chefs were concocting their creations. The music could only be described as soft or light techno-house music. It’s hard to explain, but while it was very rhythm driven, it wasn’t too loud to talk over. Our server came over to take our drink orders before finally taking our dinner order. When they brought us our sushi (below), a server came over and explained all of the different pieces of fish we ordered. The wait staff overall was very professional, knowledgeable, and efficient. 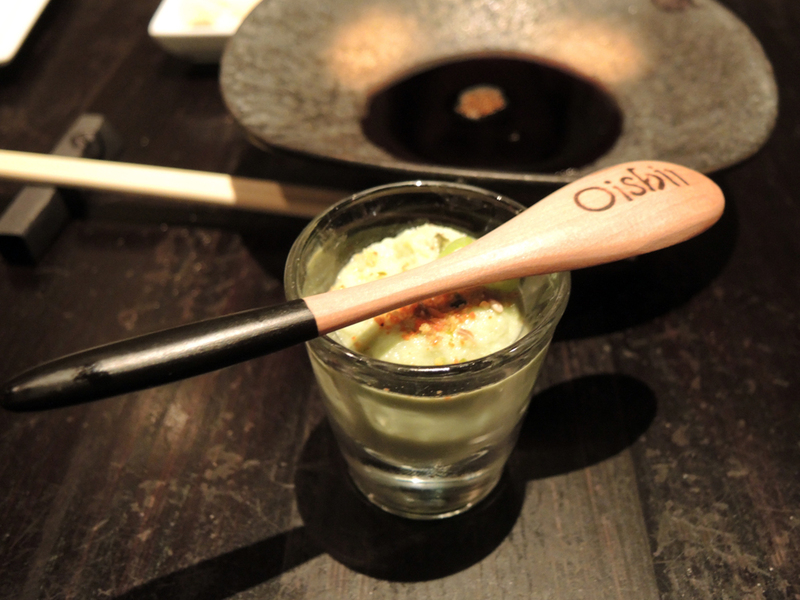 When a server came over and placed a shot glass full of edamame mousse in front of us and said, “Complimentary,” in a Spanish accent, I thought maybe they were trying to impress the potential food-blogger guy with the camera. Nope. This little treat comes to everyone at the restaurant regardless of your camera wielding ways. The soft, grainy edamame tasted wonderful and reminded me a little bit of hummus, but without the sesame flavor. It was a nice way to start our meal and gave me the impression that we were in for a well thought out dinner by the chef. As I’ve mentioned before, when I go to a restaurant for the first time, I’m often intrigued by their signature cocktails. On this occasion, I had the Ting’s Sushi Companion. 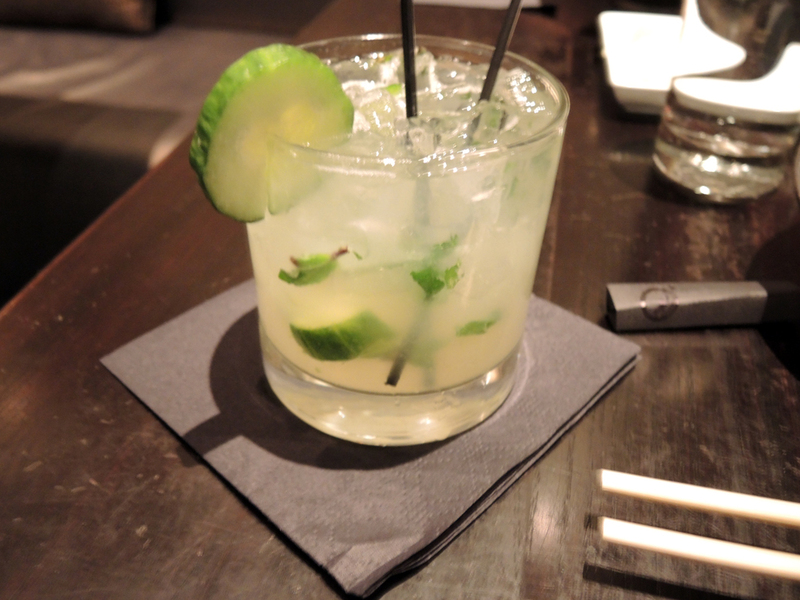 It’s cucumber infused sake vodka with muddled mint, cucumber, lime, agave nectar, and a splash of soda. This reminded me a lot of my own recipe for a Cucumber Vodka and Lime drink, but Ting’s had refreshing mint and the added sweetness of agave nectar without being too sweet. An extremely well-balanced drink that I was very happy to have accompanying my sushi! 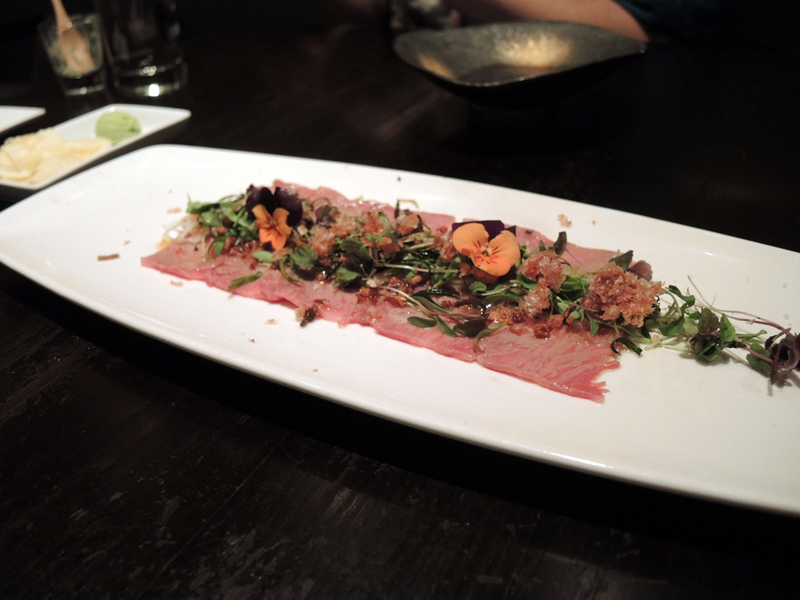 As an appetizer we had the Kobe Beef Carpaccio. We wanted to try something a little different because we were going to have sushi for dinner, but we also wanted to stick to the Asian and raw theme. Kobe (Wagyü in America) beef is a type of Japanese grain-fed cattle that is considered some of the best in the world. Part of what makes this beef so coveted is how it is raised. Many prized cattle farmers allow the cattle to roam free to limit stress that can toughen the meat and they even go so far as to massage the cattle daily. Some even brush the hair of their cattle. In addition to the raising of the cattle, the texture of the meat is particularly tender due to the extensive marbling of the fat throughout. While I very much enjoyed the flavor of this appetizer, I found it difficult to really taste the meat. I did get some sense of the great delicate texture, but the flavors of the delicious toppings/dressing (micro greens, fried shallots, soy, and pickled cherry blossom tempura) very much overpowered the flavor of the meat. For dinner we had the Chef’s Choice Sushi and Sashimi. Normally, I would order my own choices, but in this case I wanted to take full advantage of where I was by taking the chef’s suggestions. While the meal was pricey (nowhere near what some other places might charge though), I was extremely happy with the Chef’s choices because I got to try some pieces of fish that I would never have ordered. The sushi that came with the chef’s choice is below. From closest to the viewer to farthest on the dish were: sardine, a kind of grouper, another kind of grouper, salmon, and something I can’t remember at the end. I know what you’re thinking. Sardine? Yes. Sardine. I would never have picked that for myself even though it looks beautifully strange with the skin on like that. As one of the most common fish we had all night, it definitely let us know the high quality of the sushi. It tasted like a sardine, but the freshest, cleanest sardine I’ve ever had. The two grouper next to it were completely different from one another. The one closest to the sardine was cleaner and firmer in texture while the next piece was softer, but had more of that ocean taste. The salmon was fresh, but it paled in comparison to a piece of Alaskan Salmon sashimi (below) that I also had that night. Even though the sushi was incredible, the star of the night was the Sashimi. Not only was the presentation immaculate, it tasted even better than it looked. 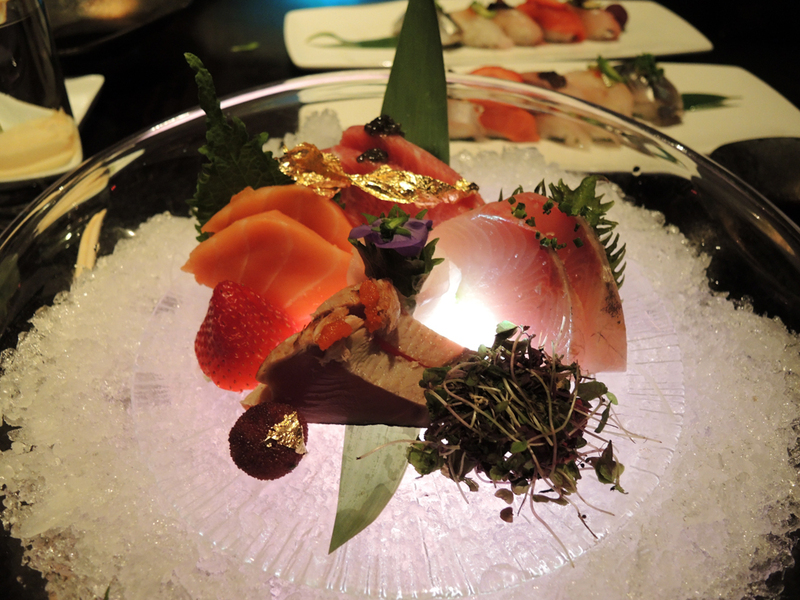 Yes, that is gold leaf on the fatty tuna in the back and yes, that is a light shining out of the ice in the bowl. From the back and clockwise, the pieces of fish were: Fatty Tuna, another Tuna, supposedly a Bluefin Tuna, Alaskan salmon, and in the middle, a bit of shark. The Fatty Tuna was so tender, fresh, and full of tuna flavor. The texture was a little stringy because of the fat, but it was so soft, that it wasn’t an issue. Just wonderful. It was my second favorite piece of fish all night. The tuna to the right of the fatty tuna was also extremely fresh and a little firm, so that was a nice change in texture. It had a slightly more fishy flavor than the fatty tuna, but still wonderful. The worst offender of the night was whatever piece of tuna was at the bottom. It was lightly cooked (or maybe it was “cooked” using citrus on the outside), but it had a very strong fish flavor that almost bordered on un-fresh. I hate to think that maybe they were just trying to move this piece of fish because it was about to go bad, but if they weren’t then it is just not a great cut or flavor. My girlfriend didn’t even finish hers. The shark in the center was more of a firm stringy texture, but it’s very light flavor made it refreshing. Lastly, my favorite piece of the whole night was the Alaskan Salmon. I couldn’t believe how good this was. I don’t even care all that much for salmon (especially if it’s cooked – blech! ), but this blew my mind. It was better than any salmon I had ever had, the flavor was light, but the fish itself was meaty and filling. I could have just eaten this Alaskan Salmon all night and been deliriously happy. I ate one piece to start and one to finish as perfect bookends to a great entrée. Truly incredible. What’s a birthday without dessert? Strangely enough, my girlfriend and I were very full, but we really wanted to give dessert a try. We ordered the Sesame Ice Cream Bonbon and what arrived was a work of art. It took quite some time for them to bring us dessert and just as I was wondering what was taking so long, I saw the work with my own eyes. The sesame ice cream nestled inside a chocolate cup covered by a delicate veil of burned sugar caramel. The dessert arrived with a birthday candle stuck into the strawberry. When making the reservation, I had mentioned that it was my girlfriend’s birthday and without any fanfare (like an obnoxious song), the server quietly wished her a happy birthday while placing the dessert. After blowing out the candle, it didn’t take us long to dig in. The ice cream looked like it was freshly mixed with black sesame seeds and the burnt sugar caramel veil added new dimensions to the flavors. Very well done! A beautiful presentation of wonderful food. Highly recommended if you are willing to shell out some extra cash for a very unique experience. Unfortunately, Oishii has ruined me for regular, casual sushi. I will surely still eat sushi of a lower quality, but I will definitely take less joy in it after experiencing what sushi should be like. A disturbingly humorous sushi song and dance. On a scale of 1 to Jiro? They also have a smaller location in Wayland, MA which serves high quality sushi but without as much flair. It’s a smaller restaurant but the quality is on par…we like to get takeout and enjoy it at home with a bottle of Champagne. I highly recommend trying sushi and Champagne if you haven’t already, it’s a match made in heaven. Sushi and Champagne sounds amazing. Is there any type of champagne you recommend for sushi in general or specific types of sushi? Maybe something from your blog? Thanks for the recommendation! I saw it online and I really wanted to give the Chestnut Hill location a try as well… especially since it’s so close to Boston College where I went to school. 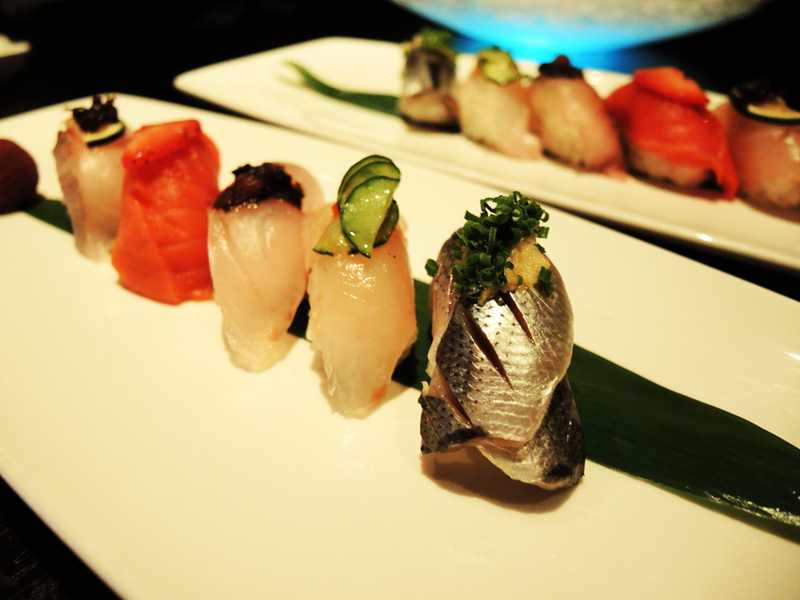 I also want to try Oga’s in Natick and Oya based on the wonderful pics from your blog!